Finally, a calendar sync solution that works. After my experiment with gSyncIT, I just couldn't quite get past some of its limitations. Once multiple calendars get involved, things get a bit ugly. A coworker recommended SyncMyCal as a way past those issues, and I'm pretty happy. You'll see my calendaring setup to the right. Google Calendar is pretty much my primary calendar, and I have several calendars loaded. Some calendars, like US, UK, Indian Holidays and the Winterhawks game schedule are information only. However, I have my own calendar, a family calendar for events the whole family is attending, and two TripIt calendars (one for my wife, one for me) that do a great job representing any travel I'm doing. I'd like to make sure that these calendars are available (at least in free/busy form) to other Exchange users at work, and that the calendars get posted to my cell phone using Windows Mobile. The Outlook 2007 Internet Calendars feature doesn't allow this, so I needed a solution that would allow my Google calendars to merge into my single Outlook calendar. I was also looking for my work calendar to post out to Google so I could have visibility there as well. 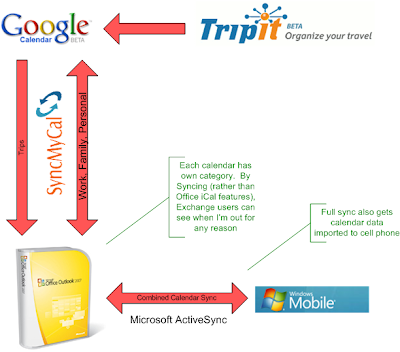 SyncMyCal had the answer through the use of category synchronization. Each Google calendar has their events assigned to a specific category, and only those events are sync'd with that calendar. Anything not assigned to a category (work stuff) gets sync'd to Google under a new "Work" calendar. I didn't need full synchronization here, but it's nice to know I have it if I need it. What's missing? I can't find a way to have SyncMyCal make all Google-sourced events private on the Outlook side (although it does sync the private flag). I have to remember to mark anything truly private as such. Not a big deal, but it's worth mentioning. This entry was posted on 7:56 PM You can follow any responses to this entry through the RSS 2.0 feed. You can leave a response, or trackback from your own site. What's very cool is that they will have Contact Sync soon as well. google links for "Emil Lerch"